Professional. The result is an 18 minute video on the ScobleShow. Thanks for coming by, Robert. Next time I’ll have a better haircut! Posted by brad at 1:40 pm on April 20th, 2007. So far we’ve given an overview of using ClearContext IMS Pro with Getting Things Done and talked about Action Management, Project Designation and Review. Our last excerpt from the setup guide Using ClearContext IMS Professional for Microsoft Outlook with Getting Things Done talks briefly about prioritization and points to additional resources available on our website. Priority is determined by the sender of the email, the recipient(s) of the email, your level of involvement in the email thread, and numerous other factors associated with the message. Designate given senders, messages, or message characteristics as higher priority and IMS will use that information to prioritize the Inbox exactly to your specifications. Messages are color-coded and ordered by priority, with the most important email from the most important senders appearing at the top of the inbox and junk mail appearing at the bottom. In addition, as you process individual emails, manually mark email conversations as higher or lower priority, changing future email’s placement in the inbox. There is a wealth of additional information on the use and optimization of Outlook available on the ClearContext Website. All of the above features are documented in more detail in our User Guide. We have created several short tutorials to help learn about the product. Check out our weblog for tips and techniques for getting the most out of ClearContext IMS and/or our User Forums for technical questions and features and tips suggestions. Posted by brad at 7:14 am on April 20th, 2007. Our last post detailed Project Designation using ClearContext IMS Pro with Getting Things Done. Our next excerpt from the setup guide Using ClearContext IMS Professional for Microsoft Outlook with Getting Things Done is on Review. Once the Inbox has been processed, IMS provides several methods for reviewing and acting on To-Do Lists. To view action items, select the ActionView button on the ClearContext toolbar and filter the results by category. This is your Action List – it shows all open tasks and appointments for the given context. Further refine the results by filtering by priority, topic, or date range. Show/hide filtering options by clicking the yellow information bar at the top of the ActionView. Select the ActionView button on the ClearContext toolbar. This creates a list of all Tasks, Appointments, and Deferred messages in the mail file. The RelatedView is a view of all related items for a given conversation. For example, your Inbox is empty and you receive a new message regarding a meeting you are attending later in the week. Click the RelatedView to see previous emails about this meeting, along with any tasks or appointments created from the conversation. 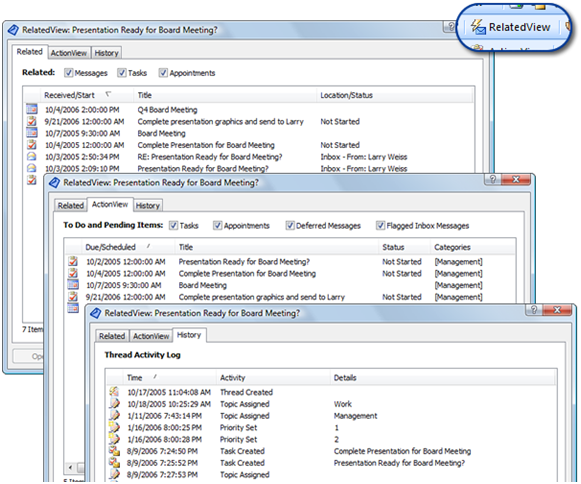 In Outlook 2007, the RelatedView is integrated into all messages, tasks and appointments. Posted by brad at 7:24 am on April 19th, 2007. Our last post detailed Action Management using ClearContext IMS Pro with Getting Things Done. Our next excerpt from the setup guide Using ClearContext IMS Professional for Microsoft Outlook with Getting Things Done is on Project Designation. Using ClearContext Topics to designate projects ensures that all messages in an email conversation – past, present and future – are automatically associated with these projects. Each email message may be assigned a Topic via the IMS toolbar. All future email in that email thread (or “conversation”) will be automatically assigned this Topic name. File Msg, Thread and Topic buttons quickly move email messages with assigned topics from the Inbox to automatically created Topic folders for later reference. In addition, IMS can automatically save sent messages in these topic folders to ensure that all project correspondence is properly tagged and stored together in one filing system. Topic assignments are automatically carried over to Tasks and Appointments generated from email conversation and Topics can be easily assigned to new items as they are created. 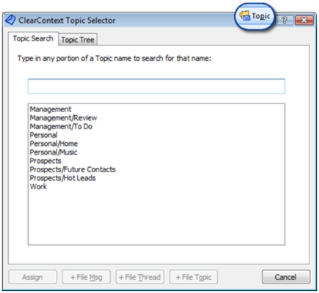 Topic Selector can be used to quickly assign Topics. Press the Topic button to the left of the Topic drop down to pull up the Topic Selector window. Start typing the Topic name and IMS will narrow the Topic list to match your search. Arrow down to select a Topic and assign to the conversation. This dialog is particularly useful for those who have a long list of projects. The Topic Selector is also launched when a file button is pressed on a message that does not have a Topic assigned. If you would like to follow David Allen’s suggestion to maintain a Someday/Maybe file, create a special IMS Topic called “Someday.” Assign Topic “Someday” to ideas that you want to think about later. Click the file button and the message will automatically be placed in a subfolder of your ClearContext Topic folder. When you’re ready to review these items, open up the Topic folder for review. Posted by brad at 8:03 am on April 18th, 2007. Our last post gave an overview on using ClearContext IMS Pro with Getting Things Done. Our next excerpt from the setup guide Using ClearContext IMS Professional for Microsoft Outlook with Getting Things Done is on Action Management. Following Allen’s advice, the bulk of your email messages (those that you can’t answer in two minutes, delete, or file away for reference) will become tasks or appointments in your trusted system. IMS Pro’s Task, Delegate and Schedule buttons allow you to quickly create tasks and appointments from email messages. Assign Outlook categories to these items to denote context, ensuring that they are assigned to the appropriate action list. Once this setup is complete, process the inbox using the IMS workflow buttons, answering those emails that you can, deleting those that you don’t need, filing reference material using IMS File buttons, and creating tasks or appointments for future work. As tasks and appointments are created, assign a context using Outlook’s native category assignment feature and one the categories created above. This will automatically associate the item with the appropriate action list. 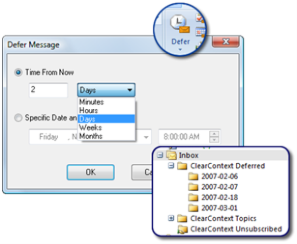 When a message is deferred, a dated folder is created as a subfolder of the “ClearContext Deferred” folder. Consider these your tickler files. Click on any day’s folder to review upcoming items or simply wait for the message to re-appear in your Inbox as scheduled. For example, say you receive an invite to a corporate networking event on the 25th. It’s still three weeks off and you don’t need to RSVP until the day before. Click Defer and “schedule” the message for the 24th. The message is moved into a subfolder with the month and day you have designated. You can click on this folder at anytime to see all messages pending for that day. Alternatively, the message automatically re-appears in your Inbox, unread, on the 24th, reminding you that you need to make a decision about the event. Posted by brad at 7:34 am on April 17th, 2007. 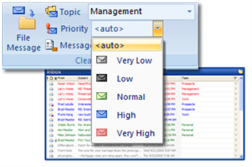 Many individuals overwhelmed with information take control of Microsoft Outlook by combining ClearContext IMS Pro’s flexible and customizable email management features such as inbox prioritization and automated categorization with their favorite parts of David Allen’s Getting Things Done methodology to create a powerful information management strategy. A number of our customers have written about their use of ClearContext to implement GTD (see links here). We have collected best practices from these writings and put them in a setup guide, Using ClearContext IMS Pro for Microsoft Outlook with Getting Things Done. Over the next week I will post excerpts from the setup guide. In it, we outline basic steps our customers have taken to set up ClearContext and Microsoft Outlook to support GTD email processing including creation of context-specific action lists, project categorization, creation and maintenance of a “tickler” file, and steps to quickly implement a weekly review. If you are new to ClearContext or GTD, use this guide to get started – we expect everyone will tweak the system to match their particular information processing requirements as they become familar with the system. For the purposes of this guide we assume that you have a working knowledge of GTD prior to implementation of ClearContext software. If not, we recommend you visit the Getting Things Done website and find some reference materials to get you started. For an introduction to Getting Things Done, see “What is GTD?”. 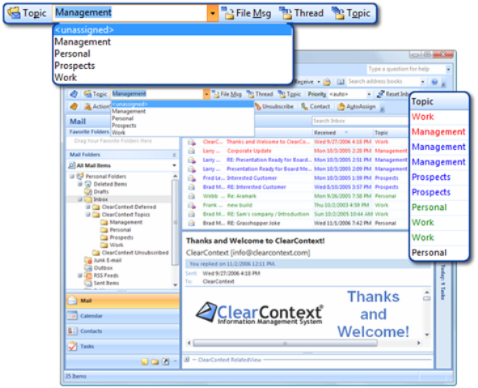 Topics = Projects: ClearContext allows the assignment of Topics to email conversations. 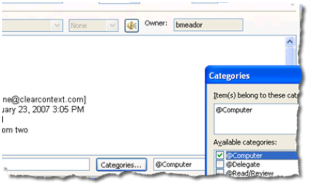 Use Topics to designate Projects and the IMS filing buttons to file email to Topic folders. Use a “/” when creating a Topic to designate sub-projects (i.e. “Project 1/Sub-Project2”). Review: Use the ActionView to review your To-Do’s by context, project and/or date. The ActionView displays all To-Dos’ – tasks, appointments, flagged items and deferred messages – and filters them by Topic or Category. In his methodology, David Allen suggests categorizing your email by project and context. Most technology solutions address one or the other well, but do not give a comprehensive way of tracking both. Using ClearContext IMS Pro, Topics can be used to maintain projects and native Outlook categories can be used to denote actions. Actions can then be viewed by project or context using the ActionView. RelatedView displays all activity for a given message, task, or appointment. This includes all messages in the current email conversation (the original message and all replies to it) and all appointments and tasks created from the conversation using one of the workflow buttons above. ActionView displays a list of global To-Do’s (tasks, deferred messages, and appointments) that can be filtered by date, topic, category, and/or priority. This dialog is the control panel for implementation of GTD in IMS Pro, providing quick access to context-filtered action lists and a method for performing the weekly review. any. ClearContext Corporation is not affiliated with David Allen & Company in any manner. The ComputerWorld article also mentions that it’s a good idea to archive off inactive content to increase Outlook’s performance. 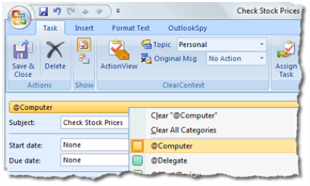 See our Outlook Performance post for step by step instructions to do just that. We’ve fixed a spotty connection issue in the latest release of our Vista Sidebar Gadget (Inbox Alert for Outlook v1.1.1). Download here. I’d like to ask a favor. If you have a Microsoft Passport/Hotmail account and you like the gadget, please take a quick moment to give us a postive rating on our Windows Live Gallery page. We appreciate the help in promoting our new product! Posted by brad at 10:42 am on April 12th, 2007.